This is a great exercise for beginners looking to gain overall strength and endurance. 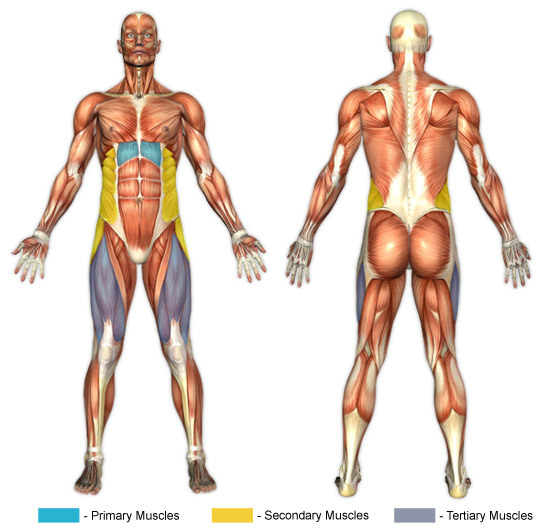 The basic nature of this exercise places it at the core of many exercise programs, although it really should not be due to its ineffectiveness in targeting the full abdominals. Lie down on the ground (or bench). Bend the knees to a 45 degree angle. Position feet beneath a fixed object. Inhale, and in a smooth, controlled motion bring the torso up until the arms connect with the upper thighs. Slowly lower the torso back down until the torso is just short of the floor, exhaling throughout the movement. This exercise is one of the most basic exercises for the upper abs. It requires minimal conditioning but also targets muscles minimally. With only one muscle group being used in the exercise, it is not an effective exercise. To its credit, it serves as a useful bridge to more difficult abdominal exercises. It is recommended to incorporate lower ab exercises in addition to crunches for a full abdominal workout. Utilizing one's own body weight for exercises allows for a greater number of repetitions. Depending on one's conditioning, repetition amounts should range from 25-100 per set. Often, people will put themselves on insane abdominal programs to achieve the "6-pack" look. What many fail to realize is that while focusing on increasing abdominal strength helps the muscles grow larger, the outer lay of fat between the abdominal and skin is what often prevents the "6-pack" from showing. So in some cases these individuals may have a great set of ripped abdominals that are concealed by adipose tissue (fat). See the Cardio and Nutrition sections for more information.